If you’re one of the many people who have already jumped on the social media bandwagon, chances are that you either have WhatsApp or Facebook Messenger on your phone. Messenger apps are the new trendsetters these days. Traditional text messaging services are the things of the past now, especially with messaging apps on the rise. A perfect storm is leading to the emergence of the messaging apps market as the next big frontier for the social media growth. As if social media platforms weren’t enough to spark a new revolution, now messaging apps have become the norm. The popularity of messaging apps has grown tremendously, even surpassing social media. WhatsApp and Facebook Messenger are undoubtedly the most popular messaging apps today helping us connect with our friends from any corner of the world. However, a debate has been aroused lately as to which is the better messaging app – Facebook or WhatsApp? We highlight some key points comparing the two on various fronts. WhatsApp is a standalone messaging app and a VoIP service owned by Facebook. It is the world’s most popular mobile messaging app with a user base of over 1.5 billion. It is available for Android and other smartphone absolutely free unless you have not exceeded your daily data limit or connected to a free Wi-Fi network. It not only allows you to send photos and videos on-the-go, but also provides free audio and video calling facility anytime and anywhere regardless of where you are. 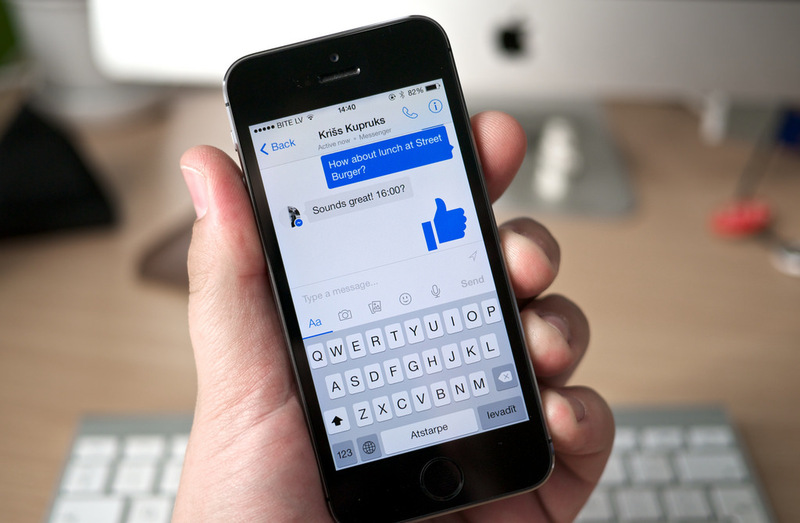 Messenger is a standalone messaging app operated by Facebook. It is the Facebook’s namesake app which operates independently but requires a Facebook login to get started meaning users can only get in after successfully verifying their Facebook accounts. It allows you to add people that have the Messenger app installed but are not on your Facebook Friends list. Unlike WhatsApp, Messenger does not have any limit on as to how many photos you can send at once. WhatsApp is a free, cross-platform messaging app and VoIP service owned by Facebook. The social media giant made its largest acquisition till date after the company acquired the mobile messaging service WhatsApp in a whopping $19 billion deal. According to figures, WhatsApp is the world’s most popular mobile messaging app with a user base of over 1.5 billion, a little over the Facebook’s namesake app which is the second most popular messaging app after WhatsApp. Unlike WhatsApp which is a standalone platform, Messenger is not a standalone app and requires a Facebook login to get started. Both the messaging apps allow you to click pictures on the spot and send right away or use camera rolls and shares them instantly with friends and family. However, Facebook Messenger has a little edge over WhatsApp, when it comes to the number of photos you can actually send at a time. You can send no more than 10 photos at once on WhatsApp which might be a little inconvenient if you want to send a huge number of pictures at a time. Facebook Messenger, on the other hand, does not have any limit on as to how many photos can be sent at once using the app. 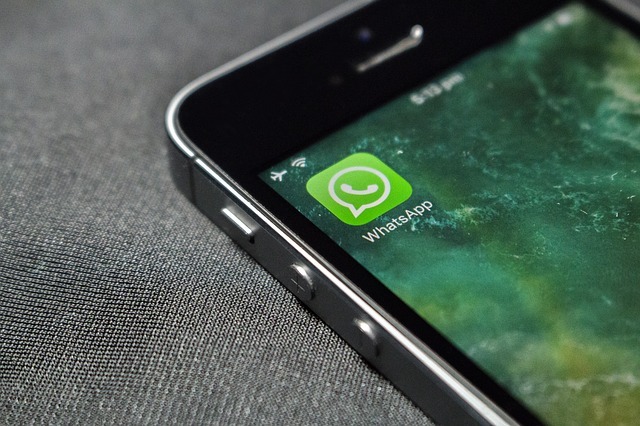 One key difference between the two messaging apps is that WhatsApp requires relatively less bandwidth than Messenger to connect and a little configuration to function. It only requires anywhere between 8 to 64 kbps bandwidth to function. If it detects a weak Wi-Fi signal, it prompts the users to switch to mobile data for a smooth experience. Facebook Messenger is a heavy application with a tendency to launch on startup and run in background, even when you’re not using the app. As a result, it consumes a lot of data and keeps sending messages regardless of the signal strength. The privacy settings in WhatsApp allow any user to view your “last seen” status, profile photo, and Read Receipts by default. You can change these privacy settings to your own preference so that only people in your contacts can see your last seen status or no one can. Anything you send on WhatsApp is encrypted, meaning the messages are protected by end-to-end encryption by default. Privacy has always been the key feature and the selling point for WhatsApp. However, these encryption settings and options are not on by default on Facebook Messenger and you have to activate encryption to do so. Both the messaging apps are packed with equally intriguing features such as the facility of audio and video calls with a single tap, great UI, ease of use, instant image and video sharing, and more. However, WhatsApp is the more feature-rich IM client with an extensive portfolio of features such as the ability to share contacts and send location updates to contacts, documents sharing, and easier login with no username and no password – just enter your phone number and get going. However, Messenger allows you to add people that are not on your Facebook Friends list but has the app installed. Well, there are a few areas where the WhatsApp dominates and then there are a few where the Facebook Messenger seems useful and a little edge over WhatsApp. Both are equally feature-rich and easy to use, with slight differences here and there, which are not even worth mentioning. So it’s entirely up to you as to which is the better messaging app Facebook Messenger or WhatsApp because everyone is entitled to his/her opinions. WhatsApp, however, is clearly the most popular IM client out there with a user base of over 1.5 billion which is a milestone in itself. But Facebook, with a user base of almost 1.3 billion is not behind either. Sagar Khillar. "Difference Between WhatsApp and Facebook Messenger." DifferenceBetween.net. 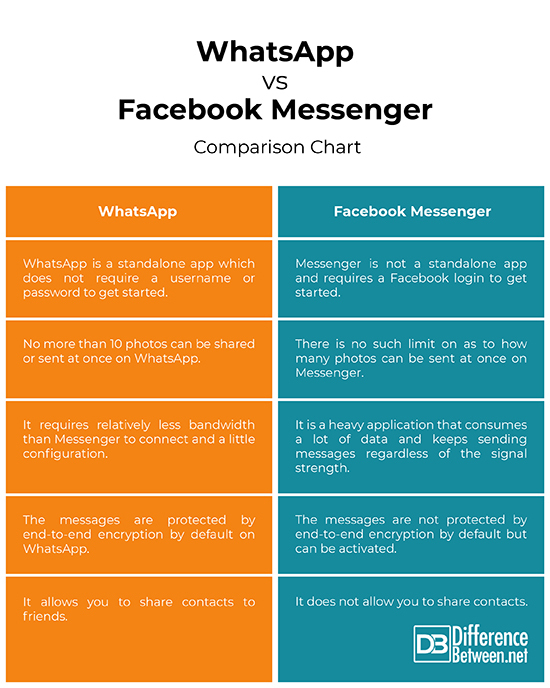 September 28, 2018 < http://www.differencebetween.net/technology/internet/difference-between-whatsapp-and-facebook-messenger/ >.